We recently inspected a solar farm which showed a large number of thermal anomalies. The anomalies were widespread and clearly visible from our SolarGain thermographic drone, even in late winter low irradiance, <400W/m². On closer inspection using a handheld thermographic camera, it was incredibly difficult to see these anomalies. 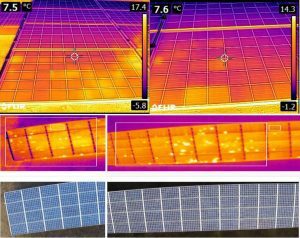 This demonstrates how when carrying out ground based hand held thermography, it is very easy to miss low temperature defects which could indicate early degenerative problems for the solar asset.